Designed, engineered and built as a pure driving machine, the all-new Alfa Romeo 4C is an uncompromised thoroughbred that marks the return to the world of lightweight sports coupés for the Alfa Romeo brand. Its natural beauty is defined by function; the need to wrap the engine and chassis in a compact, aerodynamically-efficient shape, making it a worthy descendent of one of the most beautiful coupés of all time: the Alfa Romeo 33 Stradale. ALFA TCT dry twin clutch semi-automatic transmission and the Alfa D.N.A. driving mode selector – now with a new “Race” mode. 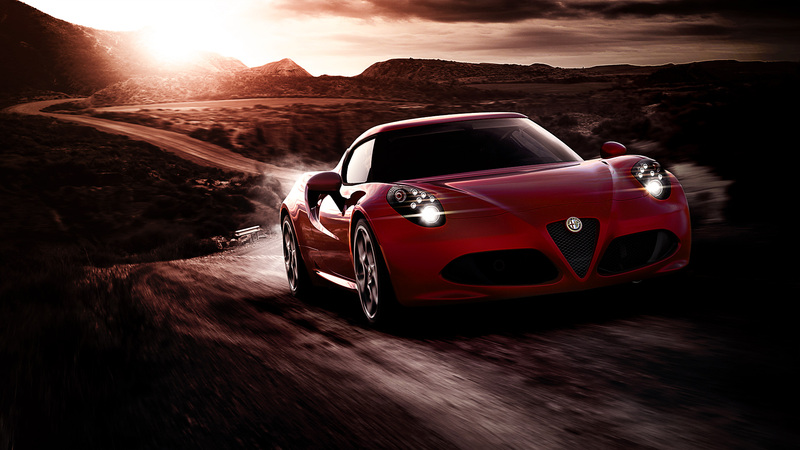 – and is built using sophisticated Formula 1-derived technologies, evolved especially for Alfa Romeo. SMC (Sheet Moulding Compound), which is lighter than both steel and aluminium, is used for the bodywork while even the thickness of the glass has been slimmed down by 15% to help reduce the Alfa Romeo 4C’s overall weight. Less than 4m in length and with a wheelbase of 2.38m, the Alfa Romeo 4C’s compact shape accentuates its remarkable agility. With a dry weight of 895kg and a 40:60 front-to-rear weight distribution, the Alfa Romeo 4C is capable of generating 1.1g of lateral acceleration and in excess of 1.2g of deceleration force.